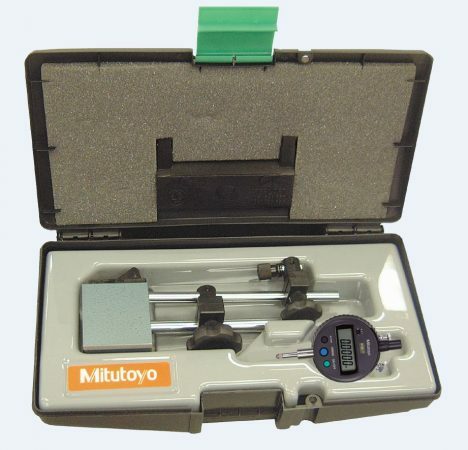 Mitutoyo's precision tool kit includes a magnetic stand and digimatic indicator set. Mitutoyo’s tool kit offers a digimatic version of one of the most popular kits with a magnetic stand and indicator combination in a custom storage box. No. S950-783 Tool Kit includes: 7010SN Magnetic stand accepts dial, digimatic and test indicators (Ø6mm, Ø8mm*, Ø9.5mm (3/8”) *supplied with a spacing collar. 543-783B ID-S Digimatic Indicator is a Flat back style with simple design and an industry favourite (Range: .5”/12.7mm, Resolution: .0005”/0.01mm. It features ABSOLUTE encoder technology, and SPC output. Functions: Origin-set, Zeroset, counting direction switching, Power ON/ OFF, Data Output. Optional SPC output cables are available. Custom Tool Case is designed to store and protect components while not in use.